Replacement sliding patio doors from New Leaf Windows and Doors offer a range of alternatives, all constructed to give the highest standards of security and ease of use. We offer both timber and timber-alternative products to match the style of your house and existing windows and doors. We supply and fit in Desborough, Kettering, Rothwell and throughout Northamptonshire. Our natural wood patio doors are built to stand the test of time, and available in traditional or contemporary appearance. The timber products are manufactured using top grade redwood or hardwood for durability and long life, and are crafted with wedged mortice and tenon joints for strength. All doors are finished in our workshops and available in an extensive choice of designs, frames, locking systems and door hardware. 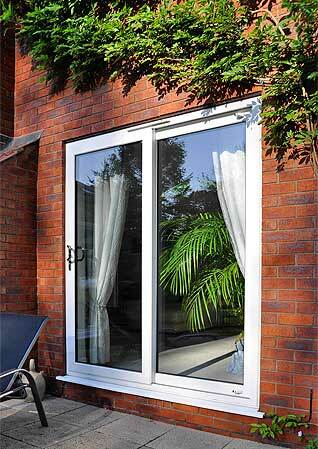 All our timber patio doors are supplied with the option of bare timber, paint or stain finishes. The latter make use of micro-porous sealant, primers and top coats. There is an almost unlimited choice of colours and the finish provides long-lasting weather protection and elasticity, eliminating the risk of distortion that can occur with other finishes. We also supply and fit an extensive range of extremely high quality timber-alternative doors. Available in a very wide range of designs, and a large selection of colours and wood-grain finishes, these doors offer the highest standards of security and weather resistance. These doors are effectively maintenance free.